he Parker Mixy was introduced in the Autumn of 1979, made by Parker in France. It was a cheap alternative pen aimed at the low cost-market, a so called "School-pen" or "Student". It had a very nice straight clip with a rounded end and a black etched arrow with six stylised feathers. The first model was a flighter with a steel body, cap and nib, It was advertised on TV as a "space vessel". Soon it was offered in three solid colours. It was offered as a fountain pen, ball pen and felt tip. By the summer of 1980 it was also being manufactured in the US and UK, but these English versions came with a clip close to the design of the Parker "45" and the model was referred to as the Parker "15". The Flighter version was not advertised, nor was it offered as a ball pen or felt tip. It was priced at $7.50. The French Mixy was phased out in 1981. And by June of 1982 the Parker "15" line was merged with the Jotter in the US, adding the colour Light Blue and a roller ball to the line, while it was still referred to as the Parker "15" in the UK..
y 1983 it was offered as a fountainpen/ballpen duo, often in a box, with two ink cartridges. There were two models, the Special CT and the GT. The Special CT had molded plastic barrels and stainless steel caps and nibs. It had chrome trim (CT) and came in the solid colours of black, blue and red. There was also a flighter (all steel) CT model offered. The Flighter fountain pens sported a nickel plated connector and the plastic CT fountain pens had a nickel plated barrel band. NIb sizes offered was extra fine, fine, medium and broad. The GT was a model that had a matte epoxy resin coated stainless stell cap with 23k gold plated trim (GT) and nib. The GT became very popular since it had the look and feel of a much more expensive pen. 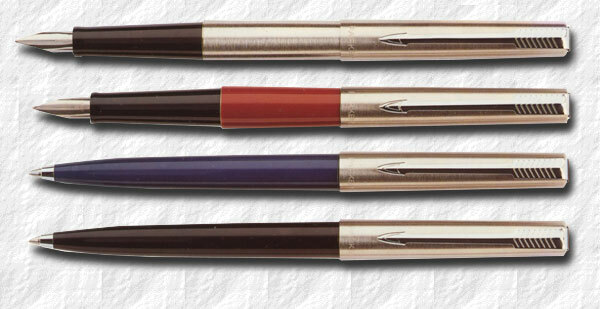 The "true" Parker "15" ball pens had the same square flat top as the fountain pens and was cap actuated (as opposed to the button actuated Jotter ball pens). In 2000, Parker eventually decided to merge the line with the Jotter also in the UK. The later Jotter 15's has been offered in a wide range of colours and designs, including "demonstrator" versions with clear plastic sections, and bright colours like Lime yellow, Energy blue, Cadet Blue, Burgundy, Pink. White and Orange. Read more under Jotter. Parker Mixy, made in France. Image © 2011, courtesy of Kent Leichliter. Image © 2011, courtesy of Tsachi Mitsenmacher. Parker "15" CT fountainpens Flighter and red, ballpens in blue and black, 1989. Note the flat top on the ball pens, the Jotter ball pens sports buttons.